Mangaluru, Oct 23, 2018: Fischo Festival, a three-day cultural extravaganza to mark the golden jubilee celebrations of the Fisheries College, Mangaluru, began with a lot of hype October 22, Monday. Inaugurating the festival, district in-charge Minister U.T. 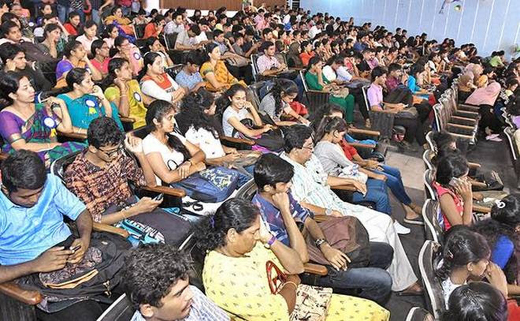 Khader urged the college faculty to enhance their contribution to the fisheries sector. New research and technology in the sector have to reach fishermen so also various government projects, he said. Responding to college dean H. Shivananda Murthy’s request for Rs. 8 crore government aid to build the golden jubilee building, Minister Khader said that he would strive to get all the facilities required for the college. Various cultural competitions are being organised for college students from Dakshina Kannada and Udupi districts. While students from the Fisheries College too compete in the competitions, they would pass on the prize to the next winner if they win one, said festival coordinator and head of agriculture science centre in the college A.T. Ramachandra Naik.